Friday Campaign Blogging: Would You Buy a Used Car From This Cat? 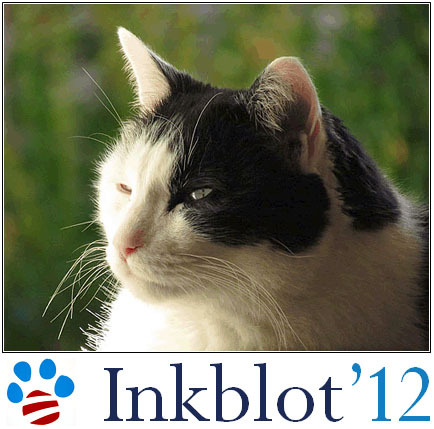 In the last election cycle, Inkblot announced his candidacy for president ten days before the election. Too late! He’s learned his lesson, though, so today he’s throwing his whiskers in the ring for 2012. His official campaign poster is below. My mother says he looks shifty. I say he looks tough-minded but visionary. On a policy note, he’s running on a promise not to raise the debt ceiling, which should go over well with his core tea party supporters. However, instead of cutting spending, his plan to balance the budget involves extremely punitive taxation against dog owners. I’ve advised him that this sends a muddled message to his followers, but he’s a cat of principle and refuses to back down. He also plans to release much-needed supplies from the Strategic Cat Food Reserve and to break off diplomatic relations with Germany because they invented the German Shepherd. More details and white papers to follow.